This Museo Mundial Project installation that has been set up in the Natural History Museum in Nuremberg aims to shed light on the topic of modern slavery. Millions of people worldwide live under conditions of modern slavery. Some instances are reminiscent of much older forms of slavery that have long been illegal, such as in Mauritania, while some are forms of bonded labour, and others involve forced child labour. 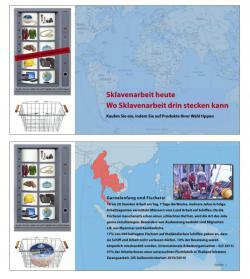 This installation sheds light on forms of forced labour that are connected to everyday goods consumed in Germany. Where does modern slavery touch upon our lives? In the museum, the installation is connected to a diorama portraying a slave hunt (as imagined by 19th century Nuremberg pewter figure producers) and opposite a showcase displaying manilas (slave money), which were used in the slave trade as well as for trading tusks or palm oil. The main feature of the installation is a touchscreen depicting a vending machine holding nine everyday items like cosmetics, chocolate or smartphones, as well as tombstones or hard hats representing exploitative working conditions for immigrants into the EU. If a visitor touches an item of his or her choice, it drops directly into a virtual shopping basket and more information about the conditions under which it is produced appears on the screen. A tenth item in the vending machine, a globe, leads to more facts and figures on different levels. 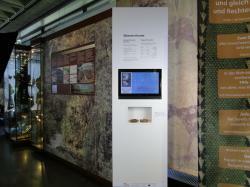 Under the touchscreen there is an alcove holding some manillas (slave money) that visitors may handle. An information panel introduces the definition of slavery and gives an overview of the "prices" of slaves. This shows that the slaves of today are by far cheaper than their predecessors. Installation measurements: 700 mm wide, 490 mm deep and 2350 mm high. This tool sheds light on Millennium Development Goal (MDG) 1 ("Eradicate extreme poverty and hunger") and MDG 8 ("Develop a global partnership for development"). It refers as well to the topic of education, which is denied to working children, and to health issues (MDG 2 + MDG 5+6). Conjointly choose the object and topic you want to work with. The form of each tool depends very much on the specific museum you choose and its individual objects. Types of objects that could be connected to this development topic are, as in our case, showcases displaying scenes and objects from the history of slavery. However, a specific product that has been produced through slave labour would be equally valid. Other possible topics are children and work, or agriculture. Make sure you create a comprehensible and clear connection to the existing objects. → Try to stick as closely as possible to the thematic focus of the object you want to work with. Find connections to the region, the actors involved and the style of storytelling used in the object. Choose an aspect of the topic that is both complex enough and well-defined enough. Do you want to offer an overview or highlight a specific commodity? Would you like to concentrate on a certain part of the story? If so, which part? Another option could be to present a portrait of a person who is a victim of slavery. Bear in mind that there is a connection to us as consumers through products that are manufactured under conditions that are akin to slavery. Develop interesting methods that can be used to implement your idea. Check how much space will be available at the museum, what technical facilities the museum can offer, which target group you want to address and how much money you have to invest. → Think small, start small. During the implementation process, additional ideas will arise, so be prepared to hold back some money for investing later on in the process! Develop a first draft of your idea, bringing together your ideas with those of your partners. This draft should already include a budget plan so that you can assess the practicability of your idea. It should also include a schedule for the implementation process. Produce a draft everyone agrees with and then send it to all partners. Ask for quotes for every stage of production. Try to get several quotes for each stage, so that you will be able to choose the best offer. Try to get recommendations for subcontractors that have already worked in museums. Add up the quotes and compare the total to your budget plan and adjust it, if necessary. Choose your working partners and make appointments for the production. 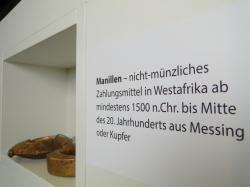 It is advisable for the carpenter to come to the museum and look at the place where the tool is going to be installed. Also bear in mind that you will need electricity, you do not want to leave wire lying around and you will need to have an access hatch for computer maintenance. 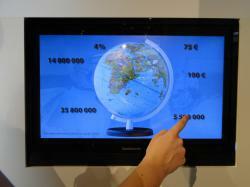 → Installations involving programming and touchscreen applications differ in price considerably. Balance their potential with their durability and price. How many levels do you need? How much animation? How many visitors do you have? How old are they? How long will the application be in place? What kind of computer is suitable for you? Is it possible to deactivate all mechanisms that might endanger the functioning of the tool? How is the computer turned on and off? What happens if the computer freezes? And how is it attached to the wall? This is where the carpenter comes into play. → Modelling a test version of the whole tool was not possible in our case. However, be sure to check the height of the screen. If it is at eye level, this provides the visitor with the best perspective. But could you still see and touch the screen properly if you sat in a wheelchair? Find a compromise. In our case, that meant 1200 mm from ground level. Create and write down the Tableaux content for the touchscreen and the information panel. Ask your partners to proofread this first version so that you can clarify any misunderstandings at an early stage. Choose pictures and graphics that reinforce the content. Ask the copyright owners if you can use their material for educational purposes. We found a lot of interesting photographs on Flickr, as well as on the websites of Fairphone and Terre des Hommes. All organisations were very generous with the sharing of their material. In other cases, you might have to pay to use this material – photographers are freelancers and need an income! Finalize the Tableaux design you want on your touchscreen. Correction loops: Several correction cycles will make the final product more professional. Ask the designer for two or three checks. Send the Tableaux drafts to the computer programmer. She or he will send you screenshots or films of the animation and do another correction loop. Think about how the computer will start. In our case, it boots up when the main electricity supply to the museum is turned on and it shuts down when it is turned off. Take the computer to the carpenter. He or she will have to fix the screen firmly to the installation. Check that the screen is accessible for maintenance, but that visitors cannot interfere with it. Fix the manillas, or other “hands-on materials” that are available in the museum, in their appropriate place with strong steel-coated wire and make sure that the wire is long enough for visitors to take a close look at the materials. The best choice is self-retracting wire. Finally, attach the printed foil that displays the title of the tool, some additional information and an explanation on the “hands-on material”. Fix the "construction" in place. Make sure it does not fall down. The installation features elements to "play" with, something that attracts visitors. It has objects for visitors to handle, inviting them to take a closer look at the object in the adjacent showcase. It is narrow and takes up little room. It displays very little "obvious" text. So, it does not scare off visitors but, at the same time, it allows those who like to dig deeper into the subject to find more information on other levels of the programme. We resorted to using a municipal institution to get the carpentry done in order to keep within the budget. The advantage for the museum was cheaper production. The disadvantage was that it was hard to agree a schedule for completion. This might result in delays. This installation was rated the most highly of all the installations. For some visitors, the installation was already too technical.